, a famous presbyterian writer in the seventeenth century, and a bitter enemy to the independents, who then bore sway in this kingdom, was educated in Trinity-college, in Cambridge, where he took the degree of B. A. in 1605, and that of M. A. in 1609. 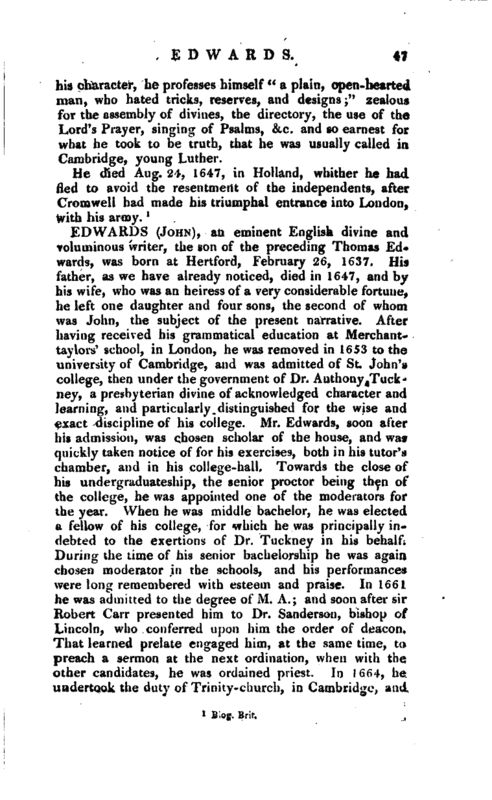 He was incorporated M. A. at Oxford, July 14, 1623. Where and what his preferments were, we do not find; but we learn from himself, that though he conformed, yet he was always a puritan in his heart. He exercised his ministry, chiefly as a lecturer, at Hertford, and at several places in and about London; and was sometimes brought into trouble for opposing the received doctrines, or not complying duly with the established church. When the long parliament declared against Charles I. our author espoused their cause, and by all his actions, sermons, prayers, praises, and discourses, earnestly promoted their interest. But, when the independent party began to assume the supreme authority, he became as furious against them as he had been against the royalists, and wrote the following pieces against them: 1. 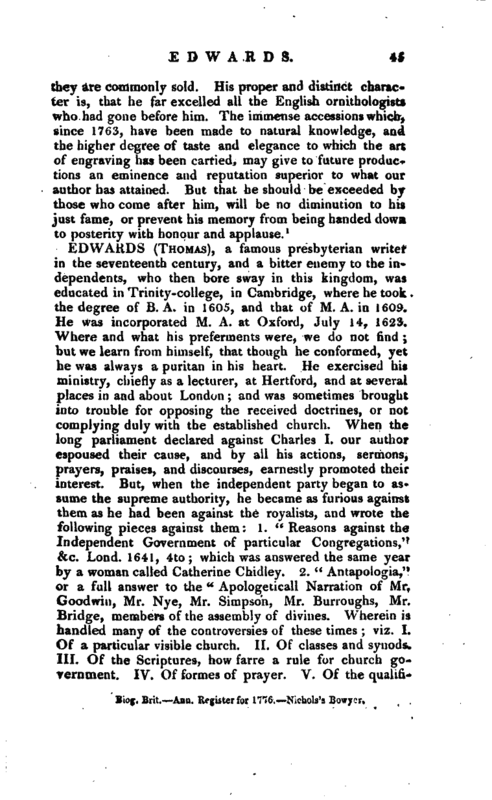 “Reasons against the Independent Government of particular Congregations,” &c. Lond. 1641, 4to which was answered the same year by a woman called Catherine Chidley. 2. “Antapologia,” or a full answer to the “Apologeticall Narration of Mr. Goodwin, Mr. Nye, Mr. Simpson, Mr. Burroughs, Mr. Bridge, members of the assembly of divines. Wherein is handled many of the controversies of these times; viz. I. Of a particular visible church. II. Of classes and synods. III. Of the Scriptures, how farre a rule for church government. IV. Of formes of prayer. V. Of the | qualifications of church members. 6.” Of submission and noncommunion. VII. Of excommunication. VIII. Of the power of the civill magistrate in ecclesiasticals. IX. Of separation and schisme. X. Of tolerations, and particularly of the toleration of independencie. XI. Of suspension from the Lord’s supper. XII. Of ordination of ministers by the people. XIII. Of church covenant. XIV. Of non-residencie of church-members,“Lond. 1644, 4to. 3.” Gangnrna: or a catalogue and discovery of many of the errours, heresies, blasphemies, and pernicious practices of the sectaries of this time, vented and acted in England in these four last years as also a particular narration of divers stories, remarkable passages, letters an extract of many letters, concerning the present sects together with some observations upon, and corollaries from, all the forenamed premisses,“Lond. 1G46, 4to, reprinted afterwards. 4.” The second part of C’angrjena,“&c. Lond. 1646, 4to. 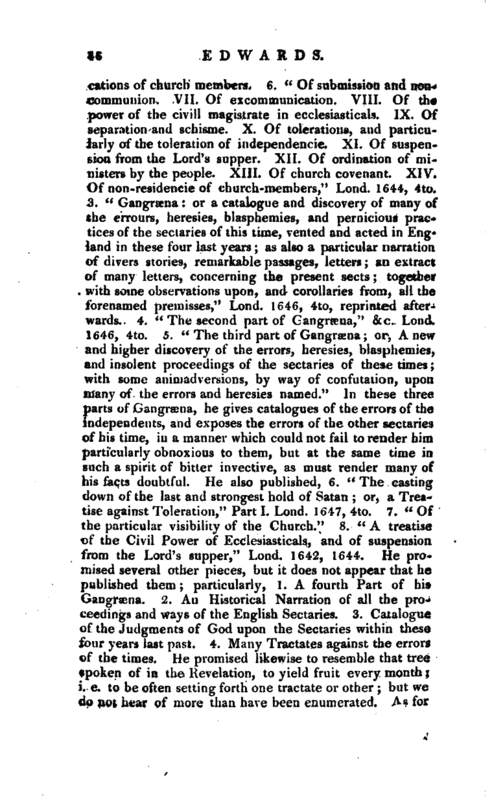 5.” The third part of Gangracna; or, A new and higher discovery of the errors, heresies, blasphemies, and insolent proceedings of the sectaries of these times; with some animadversions, by way of confutation, upon many of the errors and heresies named.“In these three parts of Gangrsena, he gives catalogues of the errors of the independents, and exposes the errors of the other sectaries of his time, in a manner which could not fail to render him particularly obnoxious to them, but at the same time in such a spirit of bitter invective, as must render many of his facts doubtful. He also published,' 6.” The casting down of the last and strongest hold of Satan; or, a Treatise against Toleration,“Part I. Lond. 1647, 4to. 7.” Of the particular visibility of the Church.“8.” A treatise of the Civil Power of Ecclesiasticals, and of suspension, from the Lord’s supper,“Lond. 1642, 1644. He promised several other pieces, but it does not appear that he published them; particularly, 1. A fourth Part of his Gangracna. 2. An Historical Narration of all the proceedings and ways of the English Sectaries. 3. Catalogue of the Judgments of God upon the Sectaries within these four years last past. 4. Many Tractates against the errors of the times. He promised likewise to resemble that tree spoken of in the Revelation, to yield fruit every month i. e. to be often setting forth one tractate or other but we do not hear of more than have been enumerated. As for | his character, he professes himself” a plain, open-hearted man, who hated tricks, reserves, and designs;" zealous for the assembly of divines, the directory, the use of the Lord’s Prayer, singing of Psalms, &c. and so earnest for what he took to be truth, that he was usually called in Cambridge, young Luther.